V2 Cigs offers beautifully packaged disposable e-cigs that offer a single use option for consumers to try. 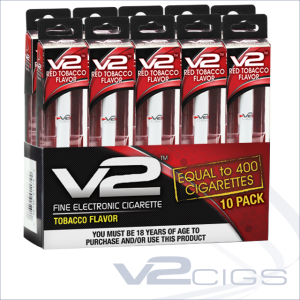 V2 Cigs is certainly part of our favorite electronic cigarettes. They offer excellent rechargeable starter kits, featuring the super long lasting V2 EX – batteries and atomizer cartridges. Not only do they have a great product line, V2 Cigs also has some of the best customer service in the industry. We put the V2 Cigs disposables to the test and we’re pleased with the product and will go over the pros and cons. When we tried their disposable e-cig, we had high expectations. The V2 Disposable E-Cigarette is rated for 400 puffs and does about 350 more for light puffers. After testing both flavors, the flavor itself is still very much V2 Cig quality, however the vapor production is a close second. It’s still pretty thick vapor and gives a good throat hit. The battery works well and features a small air hole for smooth and easy puffing. The atomizer also performed well, and only near the very end does the vapor start tasting burnt. It does die down gradually in taste and vapor volume before the end, but expected with a disposable model. It did not have the same robust vapor V2 Cigs are known for, but after using these for a few weeks, we realized it’s still a good disposable e-cig after all. Although the vapor is not as strong, its’ on par with some of the best disposables and above average overall. also limit the disposables to a 1.8% nicotine concentration. As lighter user myself, I prefer 1.2%, but this is a predicament with many disposables on the market. The cost was fair at just over 6$ per e-cig on the 5 pack and just under 6$ on the 10-pack, but with no option to buy singles, V2 Cigs is forcing you to buy a minimum of 5. Make sure to check out the latest V2 Cigs coupons for an additional discount. The main issue is not the quality, as casual vapers would still enjoy this V2 e-cig very much. Instead, the lack of flavor choice, nicotine strength, and single unit count is what we think limits the audience for this product. The cost is not too high, and if they had their full line offered, we wouldn’t mind buying them for trips and such where we rather not bring our rechargeable. Over All V2 Cigs Disposables are a good way to try out the V2 electronic cigarette and get a taste for the popular V2 Red tobacco flavor as well as Menthol, but they offer such a great product when it comes to the rechargeable models with high quality batteries and flavor cartomizers that we have to suggest that above all. Check out our full V2 Cigs review here. V2 Cigs has also partnered up with Zig-Zag and they have developed a line of disposables as well. 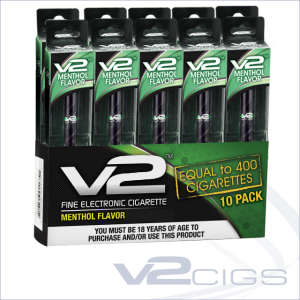 With the choice of smaller 200 puff or longer lasting 400 puff e-cigs, they are also offered in menthol or traditional tobacco flavor. Still limited on nicotine strength choice, they do have the option of 1.8% or 2.4% for extra strength. You can check our full review on Zig-Zag Disposables here, and it’s worth mentioning they also have a full line of flavors compatible and sold alongside V2 Cigs cartridges.